That’s about the reaction all of us would have — should have — on first discovering the reality of slave ownership in our own families. It’s certainly the reaction The Legal Genealogist had back long ago when I first discovered that reality in my own family. And that might have been true… if Ireland and Wales were small towns in Mississippi. I can just barely wrap my head around the concept of owning another human being in America in, say, 1790 or 1800. That’s before the Abolition of the Slave Trade Act passed in England in 18076 and before the abolition movement in the United States really started to gain steam. Although there certainly were abolitionist efforts well before then, it was 1833 before a major group — the American Anti-Slavery Society — organized in Philadelphia.7 So maybe, just maybe, some folks really didn’t “get it” when they were confronted by others who said it was wrong. Now, we’re often warned, as genealogists, not to engage in presentism — judging the past by the standards of today.8 It’s critical when we’re trying to evaluate the records of a time that we don’t judge those records by expectations of what one of those records should look like today. What has been passed down to me — this northerner my southern grandfather would have called a Yankee… in three syllables… and the first syllable wasn’t “darn” — are the “feel-good” slavery stories. How my ancestors cared for their slaves and took care of them, how their slaves loved them and stayed with them even after Emancipation. And whether these stories are true or merely the “feel-good” versions of a terrible reality, I absolutely understand what it is like to be embarrassed at the very thought of slaveowning ancestors. To have the very thought leave a bad taste in my mouth. So welcome to the club, Ben. Now pull up a chair and let’s talk about what we do about this. Because what we don’t do … what we can never do … is deny the reality of the past. Because when we try to deny the reality of the past, we are in effect writing out of our history the lives of those who were enslaved. Somewhere in this world there may be descendants of the women, aged 30 and 50, who served my third great grandparents and their children in 1850. Somewhere in this world there may be descendants of the woman aged 25 and her daughter aged three who served my third great grandparents and their children in 1860. As descendants of slaves and slaveowners alike, we should talk. Help finish each other’s tales. Not as sources of embarrassment. Not as anything to be ashamed of. Not as something to try to hide. But as interesting people whose ancestors’ lives intersected our ancestors’ lives. So how about this club, Ben? A club made up — for all we know now — of kin. A club of cousins, perhaps. If nothing more, then the “same human race” club. Welcome to this club, Ben. My husband’s family also owned slaves in the New Amsterdam/New York/New Jersey area. I was surprised and interested in this fact and did not deny it as slavery was common and as you say we cannot erase or change history. I was also aghast at the connection with slavery but sourced it on my genealogy software as just another story to include in the family history. I was not proud looking through the lenses of 2015. It was not a feel good story about slavery but it happened just like a birth, marriage or death or a location where somone lived. I can understand Ben’s feelings but not his reactive request. We can all understand the dismay, for sure. But history is what history is. We need to embrace our ethnic and cultural differences as well as our cultural and ethnic samenesses. We have so much more in common than we think, even our common involvement in things as unsettling as slavery. I think Ben has taken more heat than he deserves on this. He’s not someone for whom genealogy is a hobby or passion, it’s something he was invited to have investigated for an entertainment program. It should come as no surprise (hopefully!) that he was ashamed and embarrassed by his ancestor’s ownership of slaves. I don’t really find it surprising or inappropriate for him to have asked for the show to focus on different less unsavory ancestors, it seems like a normal human reaction. To me, the real fault is with Gates, PBS, and the producers of the show for the way they handled his request, yet they all seem to be taking far less heat over the matter. I don’t blame him at all for being dismayed. I was dismayed at the slaveowners in my own family. But yo ask for it to be hidden, to even consider acceding to such a request… No. I agree with you, Sean. And the show can’t cover the story of every ancestor anyway, so they obviously select the interesting stories (which I thought they did with Ben’s). I’m sure Ben has probably thought about his reaction a lot since then and doesn’t need all of these outsiders to be his moral compass. I believe this took place quite a while ago. It’s not the question of what was chosen to present. It’s the question of how — and why — it was chosen. Well put Judy! I agree with everything you wrote, but one phrase you used is one I can’t say without feeling sick to my stomach. There is a strong likelihood that I will find slaves in the homes of my Maryland and Virginia ancestors, but I blanch at the use of the phrase slave “owner”. Some people may have paid other people to possess persons of color against their will, but one person cannot OWN another person. I struggled for a long time to find a term that described the captors and fit the context of history. I settled on “slave holder” as a way to describe the person who held other persons and forced them to provide free labor. To me it’s more than just semantics. Owners own; these people didn’t. Holders hold; and these people (perhaps my ancestors among them) held other people against their will. I can’t condone their choices by making it sound like they had a right to “own” a human being they actually held captive. Thank you for inviting Ben to join those of us with a bad taste in our mouths and a wish for a different history. Let’s also invite him to join a club that publicly recognizes one human being did not OWN another. Regardless of what the law said. I wish I could accept your amendment to the terminology, but ownership more accurately describes the power slaveowners had over slaves. Holder is a softer word and soft is not what slavery was. Thank you for such a heartfelt and thoughful article. I, too, have to disagree with Laura Aanenson. And here’s why. If you read any of the thousands of slave narratives, the former slaves themselves used terms like owners and masters. It would be a dishonor to them to change the description or ‘Narrative’ of what names were used. Not a good idea. It’s not just changing their words; it’s ensuring that the words we choose to use accurately reflect the reality. Thanks as always for a well-written post on what is to many still a rather delicate subject. Most of my ancestors & their relatives were Northerners but a number of them owned slaves, especially in New Netherland/New York and New England. I’ve talked to many researchers of Northern families who assume that their families never owned slaves and consequently have never researched in this area to try to find out for sure. We do tend to forget northern slavery, don’t we? But it sure existed and impacted lots of people. About 15 years ago I discovered that my 4th gg-father in Louisiana owned slaves. From his partition papers I learned the names of thirteen of them. I took some time to think about what I should do with the information. What I decided was to post the information online. Why? Because it really has nothing to do with me. History is what it is. But I wanted the information out there so that if any descendants were looking for this information, they’d be able to find it. Exactly my point as well, Shirley: there are people who descend from these people — on both sides of the slaveowning equation. Not just cogently reasoned, Judy, but also poetically written. A rare combination. So glad our paths have crossed. I hope this finds post finds its way to Ben. I took an excellent Coursera online class last year entitled “History of Slave South.” In our first set of comments for that course we were asked research and reflect on how the existence of a slave society in the United States affected the area where we lived (in my case California, in other cases, throughout the US, Canada, Europe, South America, and so on). California was admitted to the Union in 1850 as a free state. Of course, I assumed that slavery in the deep south had little effect here. Not true, I sadly discovered. 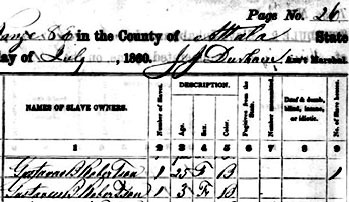 Slave owners brought their slaves with them to California; you can see examples in 1860 US census (not the slave schedules), dark-skinned people born in Alabama or Georgia panning for gold with men who were their masters in the south 10 years earlier. Prior to that, Spanish colonists had introduced involuntary servitude to the region (see Wikipedia article, “History of Slavery in California”). My classmates found the same thing, no matter where they lived, no matter what laws outlawing slavery were in place. Ripples from the US antebellum slave society impacted most parts of the globe, directly and indirectly. Our individual histories personalize a sickening collective history. Personalization, like a knife to the gut, makes the history impossible to ignore. The better we understand, the better we can deal with the fallout that remains to this day. Great post. While I have not yet found slave holders among my ancestors, I expect I will one day. Most family historians realize this. However, I know that feeling of a punch in the gut when you discover a horrific event that included your ancestor. It is these unanticipated events that cause the intense reaction. I remember enjoying my bad boy ancestors who spent time in prison, but when I was researching civil war ancestors, I found an uncle listed in a census as belonging to the 3rd Colorado. Interesting. . . until I investigated the 3rd Colorado and discovered they were responsible for the Sand Creek Massacre. Suddenly, I couldn’t breathe. I’m not surprised by Ben’s reaction. We have almost all been there. In my case, it was not slaveholders, but two great-great-grandfathers who beat a man to death in a bar. But history and genealogy are about truth and the lessons we can take from learning that truth. Ben was new to this. My outrage is directed at Henry Louis Gates. I had already stopped watching his show because it seemed every story was racially or politically based. Now we know that he did not choose his subjects based on his agenda. Instead, he simply selected which information to share, what to withhold, and fabricated a little enhancement! Is Gates our 21st century Gustave Anjou? That’s a bit harsh, Amy, since Gates obviously did not simply sell out. This whole thing was deeply troubling to him. All too true. And likely blood relatives, too. One of my great grandfather’s was “invited” to leave Missouri before he got hung for his abolitionist beliefs. My great grandmother miscarried a baby boy as they escaped to Illinois. How’s that for a bedtime story? It’s history, Toni — just part of our history. While my direct ancestors stayed firmly on the East side of the Atlantic, cousins have emigrated to many destinations. Some of them were Texan slave owners; while I find this utterly morally wrong, I am equally sure they did not within the culture of the times. However I am glad to have other connections who manned the Royal Navy ships which attempted to disrupt the slave trade from West Africa, and a chaplain ministering to freed slaves in Sierra Leone. Siân Rees’ book, Sweet Waters and Bitter, is interesting about the Naval work. To my amazement Google has come up with another mention of another man related very distantly by marriage. As recently as April 1931, there is reference to anti-slavery patrols in the Red Sea with slaves being traded into Abyssinia, and the Royal Navy trying to break up the trade. Good info on all sides, here, Graham. You have some interesting ancestors!!! Very well put, Judy, as always. I had to come to terms with this reality early in my genealogy career, but with a 100% southern family, it was not a surprise. What does amaze me is the number of people I know, including some whose families have been in the deep South since the 1700s, who are “sure” that there’s no way any of their ancestors owned slaves. They haven’t actually checked the records of course. I can’t right the wrong that was done to the slaves my ancestors owned, but I can share what I find so that those families can also find their roots. Exactly my point: we all have roots, let’s help everyone find theirs (and we’ll find, I expect, all of our roots tangled all the way!). Very thoughtful post and I also feel this is something we must acknowledge in our research and not hide. Although, I have not found slave owners in my direct lines I have found them where I wasn’t expecting to – in my father’s family. It was surprising to me to find a Jewish family that held slaves but one of the lines that married into our family were slaveholders in South Carolina. They owned large properties unlike most of my Jewish ancestors, most of whom were shopkeepers. And it bothers me a lot – not only because they owned slaves – but because I want to believe (naively) that one persecuted group will not persecute another. On my mother’s side I have only found one story – of a brother that sympathized with the Confederacy being part of a massacre party that killed his brother, a Union sympathizer fleeing Texas to Mexico with other Unionists. Not the same, still painful. I am sure the more we dig the more we will find that is painful to know. And there is so much beyond our scope of knowing. Painful stories are part of all of our history. We’ve all had them in our families, we’ve all lived them in our own lives. Volunteers blog about named slaved in their slave owning ancestors documents so those names are not captured by Internet search engines. Great initiative here, thanks for the link. Judy, I agree with you about the use of terms. In the Americas, slavery took the form of chattel slavery: human beings who held the economic status of livestock. One might use the term “slave holders” for some other cultures where slavery was a relationship that held possibilities for change and inclusion, but not ours, even when slaveowners were thoughtful, because of the legal status of the slaves, and the fact that freedom, even if granted, was tenuous and often risky. I have not yet found a slaveowner amongst my ancestors, but I have not yet investigated some of my lines in detail. I have some ancestors who were well-off northerners (and many northerners owned slaves), and some who were not-so-well-off southerners- but who knows what I might find. Thank you for opening this discussion. Ben Affleck’s response gives us all a chance to ponder this issue, and we do need to ponder it. We do indeed need to ponder it — and perhaps one day get past it. “Slave holder” might sound a bit better than “slave owner”, however, the reality is that human beings were bought and sold as Property; human beings were left in wills to the heirs as Property; human beings were bred like animals as Property. It is repugnant, and a shameful part of our past but it is our past and to deny it is to gloss over a major part of US history. That is exactly the reality, as ugly as it is. When I began researching in 1993 I was looking for a Jones ancestor in the NC State Archives and came across a will that made such an impression on me that I decided to take a copy home and hoped one day I’d find out this man was one of my ancestors. Sorry to say I haven’t broken that wall yet. Being new in this journey I had never seen anything worded quite this way and never have since. I hope you all won’t mind me sharing parts of it because even though Nathaniel Jones owned slaves, he apparently didn’t want to but at that time in 1811 there may not have been an easy way to remove himself from what he had but he obviously wanted to try and do the best he could for the slaves he cared about. Judy, I think he would have happily joined the club you so wonderfully described. Maybe he already was a member. In the name of the most high God, Governor of Heaven and Earth, Amen. I, Nathaniel Jones (of White Plains) in the State & County aforesaid, being in tolerable good health but of perfect & sound memory, blessed be the grate Governor of the Universe. •	Reason the first, agreeable to the rights of man, every humane person, be his or her colour what it may is entitled to Freedom when he, she or they arrive to mature years. •	Reason the second, my conscience the grate criterion condemns me for keeping them in slavery. •	Reason the third, the golden rule directs us to do unto every humane creature as we would wish to be done unto, and sure I am that there is not one of us would agree to be kept in slavery during a long life. •	Reason the fourth & last. I wish to die with a clear conscience that I may not be ashamed to appear before my masters in a Future World. And so Farewell to this Terrestrial World. Wow. What an amazing document. Thanks so much for sharing it. Thank you so much for this. As someone who values the insight that genealogy gives ALL of us, I so appreciate your words. And I want to invite you to a new version of our club – Coming to the Table. We are an organization that seeks to heal the wounds of slavery that have affected all of us. In particular, we help the descendants of slave owners and enslaved people connect to one another. We’d love to connect with you, too. http://www.comingtothetable.org. That’s a wonderful initiative you have there, Andi, and I will check it out in more detail. Perhaps you should follow up on this story, Judith. Ben Affleck has since changed his stance on this issue. As for the statement that slave-owning as late as 1860 being now, in 2015, “unforgivable,” take a look at the issues of today. There are many positions that will likely be considered unforgivable in 2115. Something being unforgivable today does not change the reality of the past. This sounds dangerously close to moral relativism, and to me there are clearly don’t basic moral imperatives that can’t be allowed to change with the timed. Murder, genocide, slavery… Always wrong. Thank you for this post. It was extremely painful for me to find an ancestor in KY with enslaved people in his household on pre-1850 censuses, and to discover that his heritage went back to a plantation in VA.
Homerun Judy! You’ve done it again. This should be required reading. Love your blog and I’m not just saying that because I’m a lawyer too! One thing that genealogists should keep in mind is that not all people hold historical facts in as high regard as we do. Those people live in the present and only appreciate a history for it’s entertainment value today. And there are some slave-descendants that don’t want to know slave stories. So tread lightly and respect other people’s feelings even when you don’t agree with them. If Ben was sensitive about slavery the last thing he should have done is a show with Gates, who delights in weaving slavery into any story he can. And why shouldn’t he? As a professor in Black History it is his show. Respecting other people’s feelings doesn’t mean denying the past, however. It is interesting that I did not take Ben Afflecks trying to conceal his slave holding ancestor’s info from the public. I took it as him not wanting to give publicity to someone and his actions that he personally thought were reprehensible. Their are some very twisted people in the United States, and his being found to have that kind of history, he will have found himself to be some kind of racist deity and started receiving fan mail from the KKK, Daughters of the Confederacy, Skinheads and the Aryan Brotherhood. As with any person of even minimal intelligence, you would not want to be associated with any of those people and their groups. That is the way I took it. The way he went about trying to handle the newly discovered information is Ben Afflecks problem. The leaked emails show that Dr. Gates say that he thinks Ben Affleck was getting some very bad advice from someone. And as a descendant of the aforementioned slaves, I am very proud to say that we were not only IN slavery, but made it THROUGH slavery. One of many events in history this world needs to hang its own head in shame over. That could have been part of the thinking, sure, though it would have been nice to have that made clear from the get-go. From the absolute beginning of my life, I have known that my ancestors were slave-owners. My grandmother (born in 1913) was raised in the “old plantation house” that her family had somehow held onto during the Reconstruction; and I spent a lot of time there as a child. When I delved into genealogy research as an adult, I learned that my ancestors have been on American soil since Jamestown – the family who owned the plantation, in particular, had NO NEW IMMIGRANT ANCESTORS after 1750!!! Every generation owned land – owned slaves – and every. single. person. in. my. American. lineage. (up to and including my children) was born in a Southern state. Incidentally, I AM proud to say that most of my ancestors’ wills and other legal documents mentioned at least some of their slaves by name; some even had a surname. Most who were mentioned were either manumitted or given a “restful leave from work and a home on my property for life”. This means two things: 1. The “feel good” stories are, at least in my family, somewhat true, and 2. Documents exist with valuable genealogical information that may help these slaves’ descendants find them. I hope. Yes, I’m embarrassed to write this post. I fear that posting this publicly will somehow come back to haunt me. Because the topic is THAT awful. But like I said, I can’t change the past – I can only report it. Reporting it — treating it as the fact that it was — is critical. Sweeping it under the rug… well… um… no.